Guys, guys if you don’t follow Sesame Street on Twitter you just missed the most wonderful thing to ever happen. Hopefully all of you are familiar with the story There’s a Monster at the End of This Book, in which Grover tries to convince the reader he or she should not turn the page because there is a monster at the end of the book. It was one of my favorite books as a kid and the first book I ever bought for my niece Katelyn. Today Sesame Street made my day and recreated the story on Twitter. It’s like the most happy making thing that has ever happened. In case you missed it I storified it for you. Enjoy! It seems kind of weird to write about sad songs on a blog about what is making me happy, but a song itself doesn’t have to be happy in order for it to bring joy to my life it just has to be good. Sometimes you need a sad song to wallow in or to set a certain mood. I often find melancholy music to be profoundly beautiful. Right now I’m happily not enjoying these songs because I myself am sad and need to wrap myself in music that expresses what I’m currently feeling, but their bittersweetness is something I’m digging at the moment anyway. is what completely drew me into the song the first time I heard it. I still find it amazingly beautiful. I just recently heard Heartbeats by Jose Gonzalez for the first time and fell in love. I don’t know where I missed this song, but looking up information on it I see that it’s a cover an electronica song by The Knife that he did all the way back in 2006. Having now listened to the original version I love this one all the more for how it has created such a beautiful, sorrowful song out of something that was completely different. Even though relationships don’t always work out it doesn’t necessarily mean we wish they had never happened. What sad songs make you happy? The Watkins Family Hour Podcast is a recording of the live Watkins Family Hour show put on by brother and sister Sara and Sean Watkins. If you are not familiar with them they play folk/bluegrass music. They once were 2/3 of the trio Nickel Creek. Now they both play solo or as parts of various other bands. They come together to do this show as their schedule allows. In addition to the two of them and the people playing in their band they have frequent guests including Fiona Apple and Jackson Browne. Although I knew of this podcast’s existence awhile back thanks to Sara Watkins’ appearance on the Nerdist Podcast, for some reason I never bothered listening to it until now. The podcast is now being hosted by the Nerdist network so I saw on their blog when the newest episode went up, which reminded me that it was out there. I downloaded it and then saw that there were only 8 episodes total at this point averaging only about a half hour and decided I could easily listen to all of them. If you enjoy folk/bluegrass music you will love this podcast. It features a lot of great music by fabulous artists. Episode 5 features a mashup of Rudolph the Red Nosed Reindeer and The Police’s Roxanne that is one of the most wonderful things I have ever heard. I highly recommend that you listen to it and the rest of the episodes. I am totally digging the new single Tornado by Little Big Town. It’s one of those great country songs about a woman scorned who isn’t going to take it kindly. It has a fantastic beat, and the sultry musical hook in it makes the song for me. The song totally evokes the ominous feeling of a bad storm rolling in. I love it. Sorry for the inactivity around these parts. The last few weeks have kind of been a haze because of a neverending cold followed by another cold which I still have. The main reason though was that my grandma passed away a few days before Christmas. I had the opportunity to write her obituary for her local paper, but that mostly was just a list of facts. I didn’t get to really share that much about her as an actual person. Thus I decided to pay tribute to her on my blog. 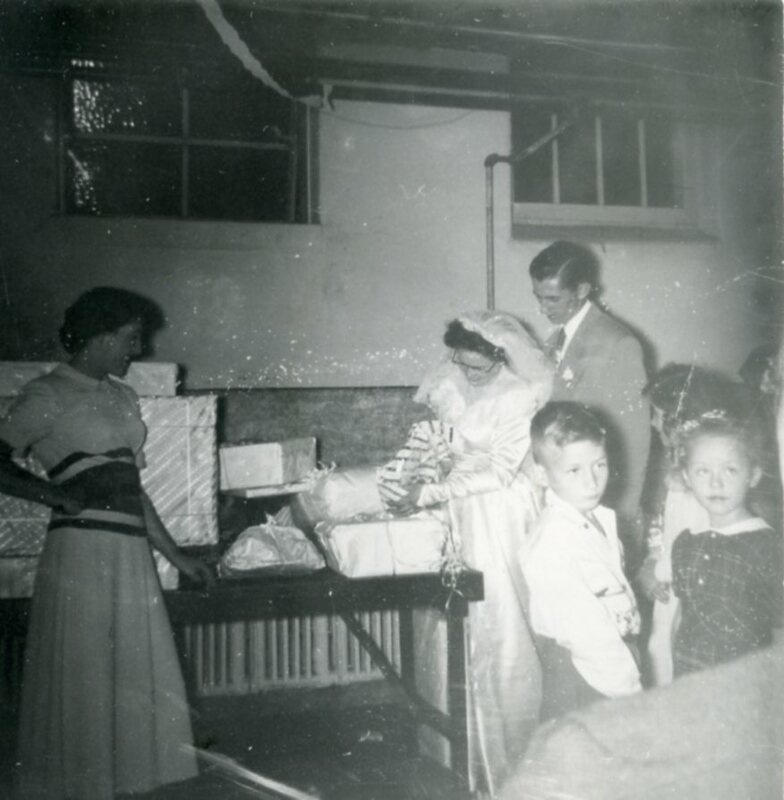 Mary Whren was born on Christmas Day in 1930. She died on December 20, 2012 just a few days before her 82 birthday. She was the mother of 2 sons and a grandmother to 3 granddaughters and 2 great-granddaughters. She was the only grandparent I really had the opportunity to know. My mother’s father died before I was born. Her mother died when I was 4. My father’s father died when I was in 7th grade, so I did get to know him a little but even my memories of him aren’t very good. My grandma was the only one I got to really know as a fellow adult. As we never lived near each other only ever got to spend time with her in person a few times a year, but we had a weekly phone call every Sunday. As one of her friends told me at her memorial service, she was the most fun woman I know. She loved her family and friends. She made friends wherever she went. Over the past few years she was in and out of the hospital and nursing homes for rehabilitation. I helped take her home from her last stint in the nursing home in September. We had to go around and say goodbye to a million people on the way out and you could tell how much everyone loved her. My grandma was hugely proud of her Irish heritage and her house was festooned with all kinds of Irish related things. She was not afraid to speak her mind and when she got angry she called it “getting her Irish up”. She could be stubborn and impatient, but she would fight for you forever if you needed it. She was a devout Catholic. She had her specific pew in church that she liked to sit in. We all made fun of her, but she would leave for church almost an hour early to make sure she got her seat. Her memorial service was held at the church last Friday and it was a lovely service remembering a wonderful woman. I have tons of wonderful memories of my grandma. When I was a little kid she lived in Illinois and we lived in Georgia, so we only got to see her a few times a year. I loved going to visit her. She always greeted us with the biggest, craziest, most exuberant hugs. As little kids when my sister and I took a bath at her house she would shake us down with baby powder after we got out. I’m talking all out baby powder going everywhere. My sister and I thought it was the most fun ever. 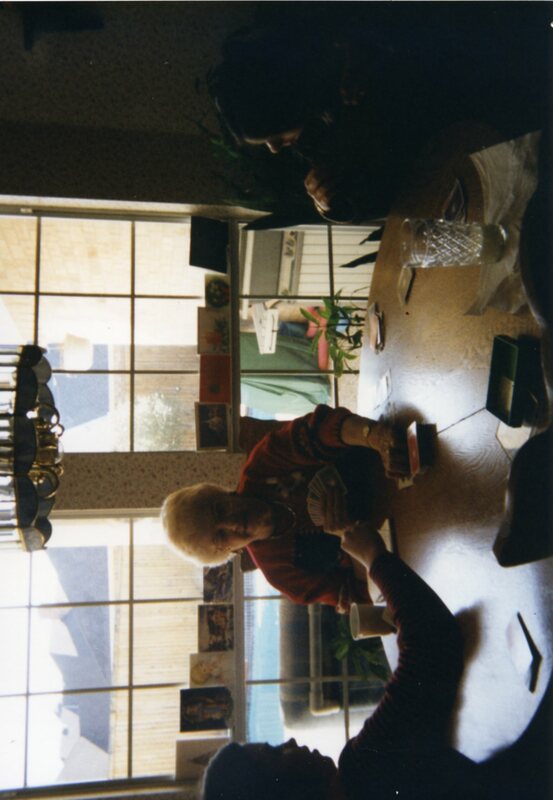 My grandma loved to play cards. She was involved in a number of bridge groups and played any other number of games. She was great at bridge, but not always so hot at other games. Everyone fought over not having to be her partner when we were playing spades. After my parents moved near her, my father and she had an ongoing game of pool hall rummy. When one of them got up to $10 in winnings the other had to pay out. My grandma didn’t get to collect very many of those payouts, but would update me on the card game every week when I talked to her. She taught me a ton of card games and continued the tradition teaching my 4 year old niece how to play her first card game, Crazy 8’s, just a few weeks before she died. I remember when I was in high school, my grandma came to visit us. My sister and I took her out to dinner and to the movies. We hung out with her and our friends playing cards. After her visit I remember my father thanking us for spending all that time with her because she was worried. Her friends had all warned her before she came that since we were in high school now we would be involved with our own lives and be off hanging with our friends and we wouldn’t spend much time with her. When my dad said that I was kind of surprised because of course I was going to hang out with my grandma while she was there. I just loved spending time with my grandma and I will greatly miss being with her in the future. Everyone deserves to have such a wonderful grandma. 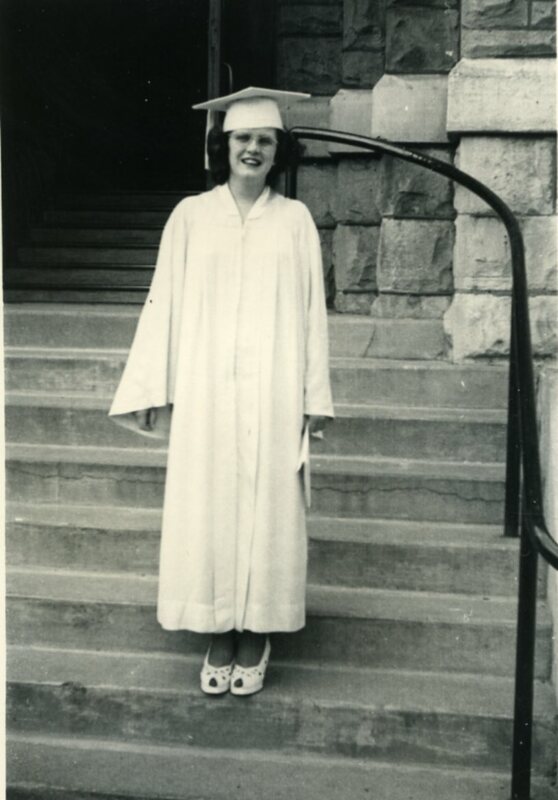 My grandma at her high school graduation. My grandparents at their wedding. 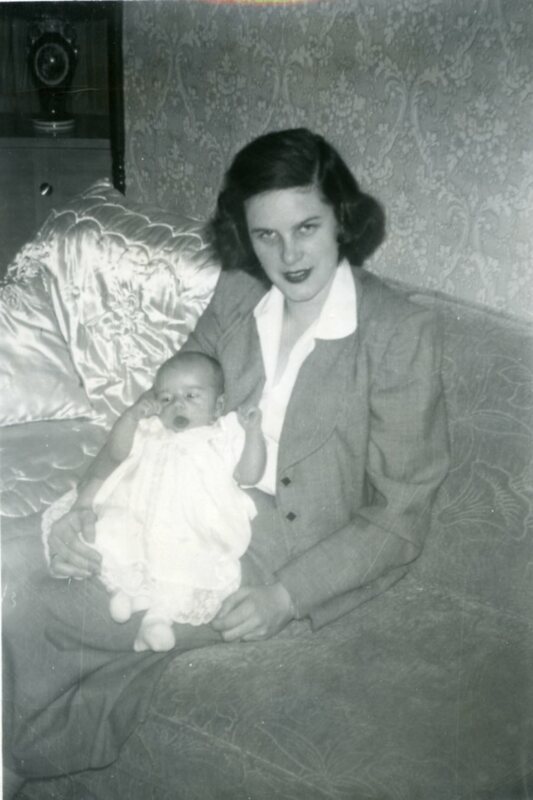 My grandma with my father as a baby. 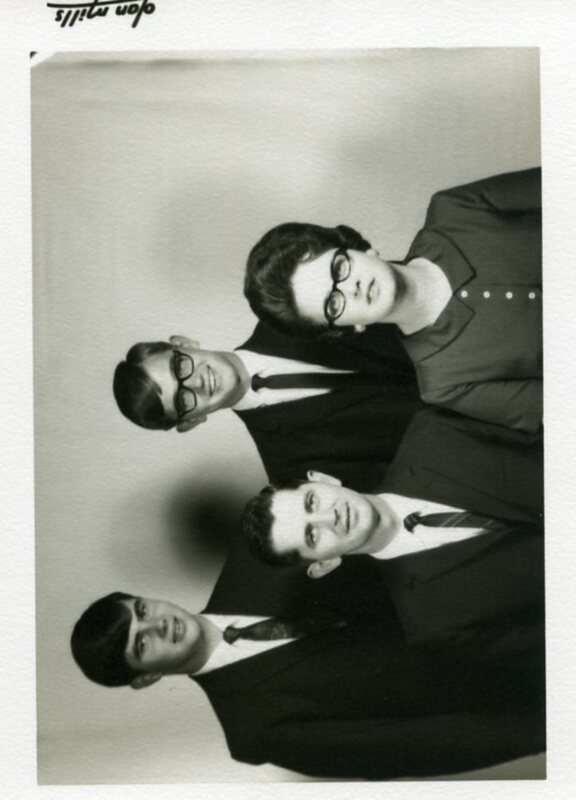 My grandparents, father and uncle. 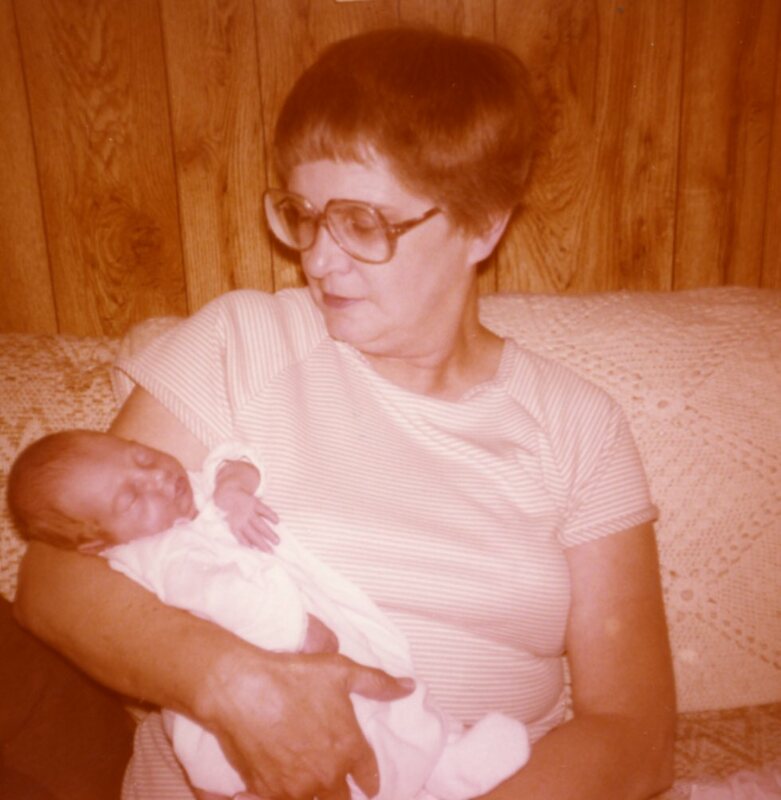 My grandma holding me as a baby. 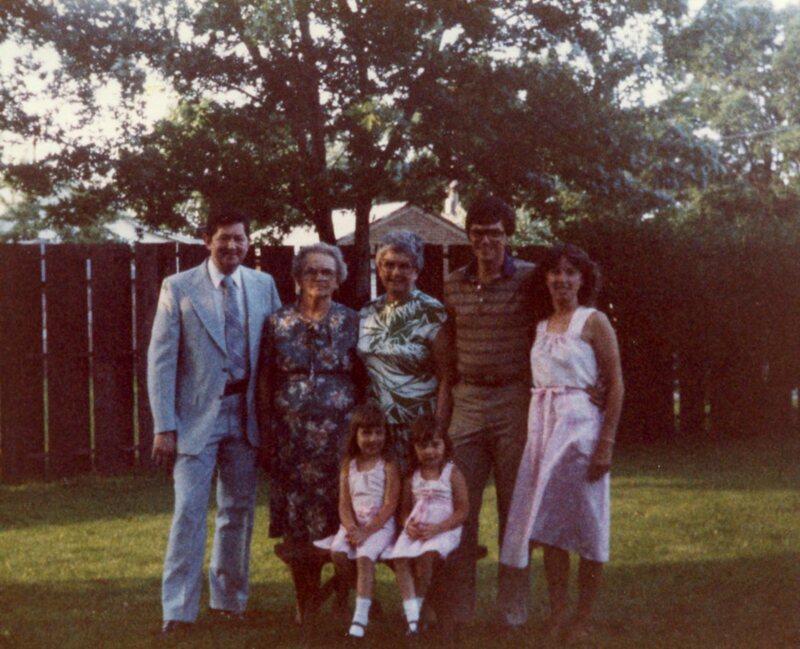 My grandparents, my parents, my great-grandma, my sister, and myself on my great-grandma’s 80th birthday. 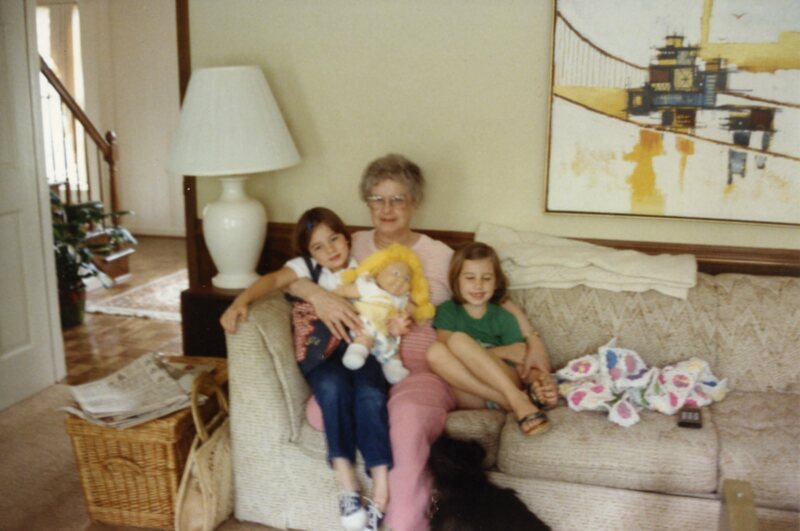 My grandma with me and my sister during one of her visits to our house. My grandma doing what she does best, playing cards. 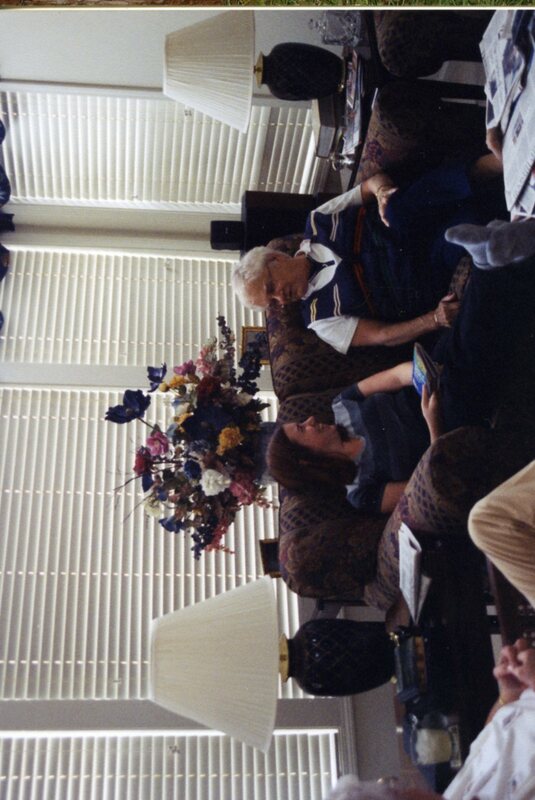 Enjoying some time with my grandma during one of my summers home from college. 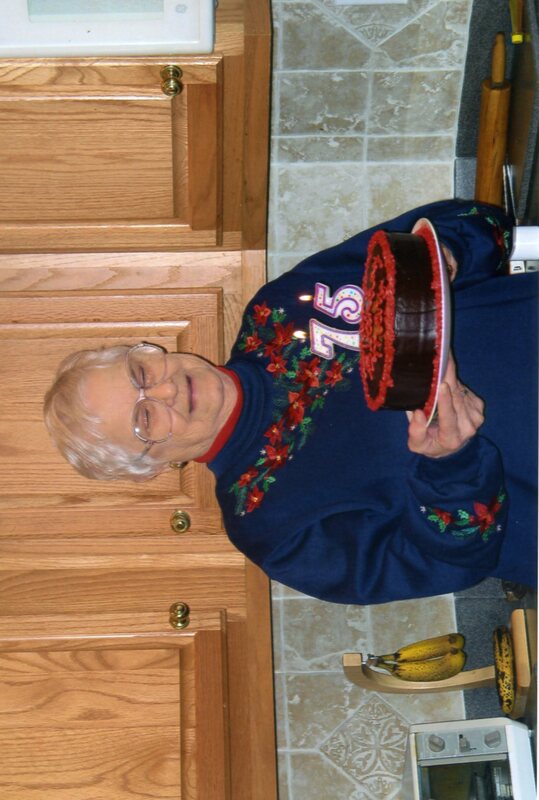 My grandma on her 75th birthday. 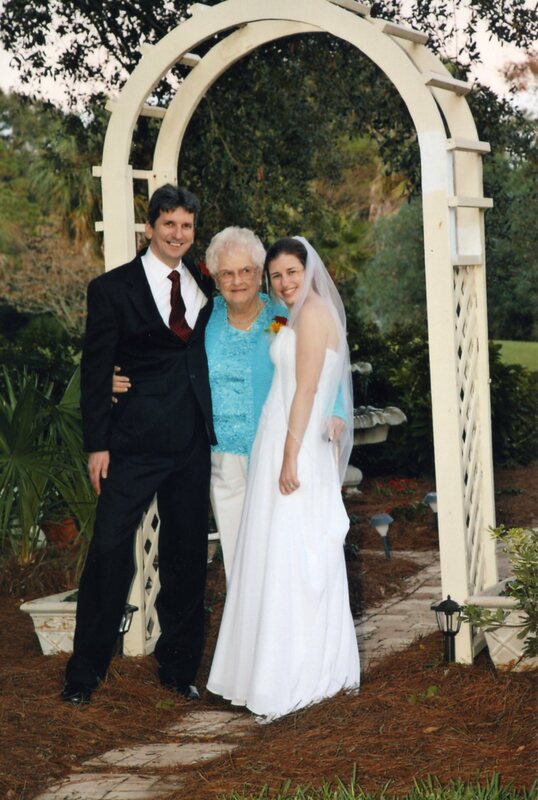 My husband and I with my grandma on our wedding day.